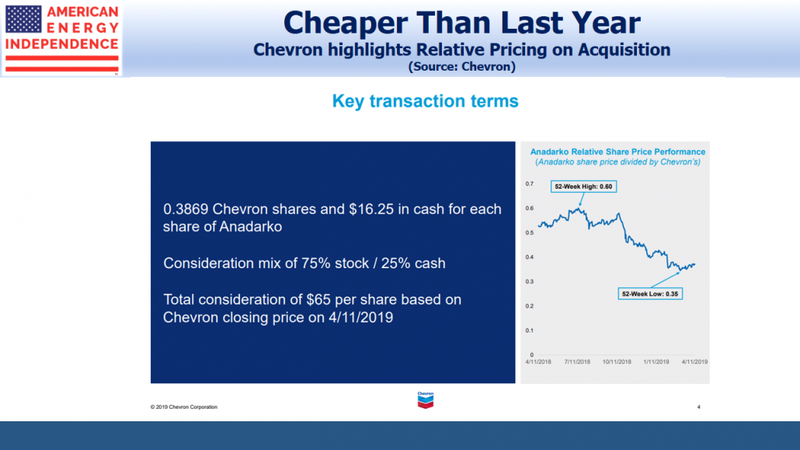 Relative pricing was an important consideration in Chevron's acquisition of Anadarko. In the early days of the Shale Revolution, independent companies led the way, applying unconventional thinking to exploit an unconventional resource. The CVX/APC deal highlights a new stage in the Shale Revolution, one favoring the scale and efficiencies of a big company. Equity markets accelerated this development, by assigning higher valuations to larger companies versus independents. In the 1990s, U.S. bankers were consolidating. My own career spans several bank mergers. Manufacturers Hanover merged with Chemical Bank in 1992, followed by Chase Manhattan in 1996 and JPMorgan in 2000. Other smaller deals occurred along the way, such as Hambrecht & Quist in 1999, and Robert Fleming in 2000. I remember the then-CEO of Chemical Bank, Bill Harrison, discussing the inevitable consolidation of the banking industry, and how he had a team that was constantly evaluating the synergies of potential combinations. Relative pricing was an important consideration. Weakness in one bank's stock could attract others who had already assessed a potential fit. Harrison had a mixed record at mergers until the combination with JPMorgan led to Jamie Dimon eventually running the company. Bill's final deal left investors in good hands. Chevron's (NYSE:CVX) acquisition of Anadarko (NYSE:APC) last week reminded me of this. The relative pricing chart that CVX CEO Mike Wirth used in Friday's call provided a useful insight into how they approached the deal. Over the past year, stock prices for the integrated oil companies (IOCs) have outperformed the independent U.S. shale drillers. In terms of CVX's currency (its stock), APC became cheaper. In effect, the market was pushing for this deal, by steadily improving its attractiveness to CVX. Investors want the world's biggest companies managing shale oil and gas output. It wasn't always this way. In the early days of the Shale Revolution, independent companies like Pioneer Natural Resources (NYSE:PXD), EOG Resources (NYSE:EOG), and others led the way. They had a willingness to experiment with different approaches, while the industry sought the most effective techniques to unlock this new resource. Observers felt at the time that IOCs were poorly suited to the type of constant disruptive innovation at which smaller companies can excel. Recognizing the unconventional thinking required to exploit this unconventional resource, huge companies like Royal Dutch Shell (NYSE:RDS.A) created new divisions with considerable autonomy to innovate. It echoed the "skunkworks" popularized by Clayton Christensen in The Innovators Dilemma. His premise was that big companies were too often so invested in their existing products and processes that they were unable to see the threat posed by more nimble innovators. And, in the early years of the Shale Revolution, IOCs were generally absent because unconventional plays didn't fit their conventional thinking. The CVX/APC deal highlights how things have changed. IOCs are no longer focused on trying to act like a small company practicing rapid innovation. Instead, they're applying the scale and efficiencies of a big company to drilling techniques that are now well established. It's the next stage in the Shale Revolution. Equity markets accelerated this development, by assigning higher valuations to larger companies versus independents. CVX exploited this in their APC acquisition. It's likely to spur consideration of other match-ups. Pipeline customers will be increasingly well-capitalized with properly-funded, long-term production plans. This should only be good news for investors in midstream energy infrastructure.